The "Now Boarding" billboard facing motorists on the 210 freeway. 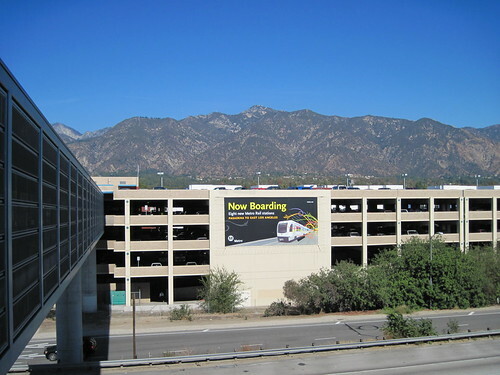 Yesterday Metro installed a Gold Line “Now Boarding” billboard on the parking garage of the Sierra Madre Villa Station at the northern terminus of the light rail line. The parking garage is on the northern side of the 210 freeway and the large billboard faces the thousands of motorists who traverse the Foothill Freeway every day. The colorful poster certainly makes the line seem inviting, but is it enough to tempt motorists out of their cars? According to Google Maps, depending on the route, it can take anywhere from 30 to 50 minutes with traffic to drive from the Sierra Madre Villa Station to the Atlantic Station in East L.A. In contrast, the almost 20-mile Gold Line takes 53 minutes to get from end-to-end. Even in the worst traffic conditions, the Gold Line isn’t much of a time saver when it comes to commuting to East L.A. — although at rush hour the Gold Line from Sierra Madre Villa to downtown is competitive with driving. Of course, speed isn’t necessarily the deciding factor when it comes to getting people out of their cars — it certainly wasn’t for me. Driving in the Los Angeles region is stressful and expensive, and the seemingly unpredictable traffic can make planning journeys unreliable. If the Gold Line takes 53 minutes, you can pretty much count on that, day in and day out. Plus there’s something to be said about spending your morning commute catching up on the latest news, getting an extra 53-minutes of shut-eye or texting (legally). As beautiful as the new billboard is, the exaggerated perspective of the train and the colorful lines bursting behind it seems to imply speed. One look at a timetable might instantly turn off a motorist. Perhaps it would be more effective if the design spoke to a stressed out motorist’s desire for comfort, rest and financial savings. These are all viable reasons to ride the Gold Line, and perhaps the rush hour motorists on the 210 need to be reminded of this. Can the new Gold Line go faster?